Hi! We are Phrozen. Over the past 5 years, we’ve been striving to produce the best printers on the market. Some of our users would always tell us "why are there so few SLA 3D printers that can print in large build volumes? Many great designs were limited because of the low build volumes of 3D printers. When making large prints, the design has to be partitioned for printing and assembled afterwards"—and you know how much fun that is to deal with. 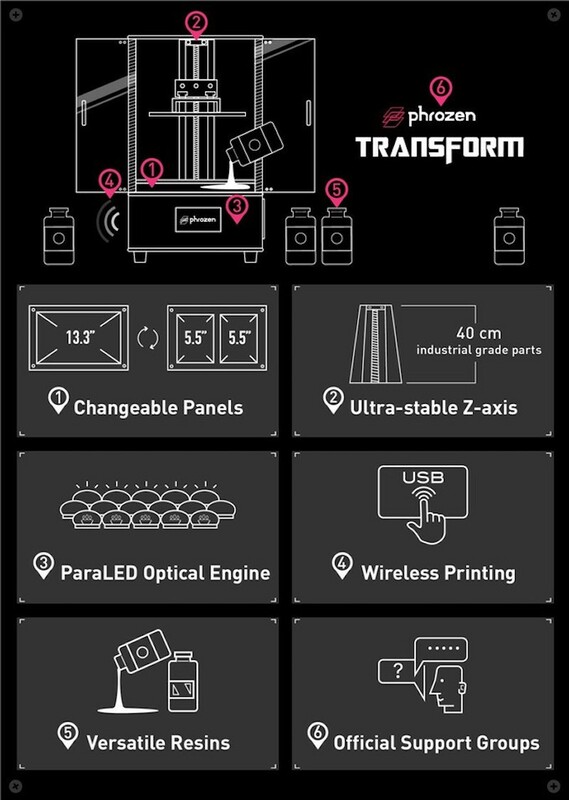 This is why we’ve created Phrozen Transform, a consumer-grade 3D printer with the largest build volume. Enjoy a 3D printer that satisfies both large-size printing with the 13.3” panel and high-resolution printing with dual 5.5” panels. FFF (Fused Filament Fabrication) 3D printers are common because they’re inexpensive and easy to use, but there are a lot of reasons why you might want a 3D printer that utilizes a different process. SLA (stereolithography) printers, for example, are great for small models with a lot of fine detail. The downside is that they usually have a tiny build volume. The new Phrozen Transform SLA 3D printer, on the other hand, is comparable to an FFF printer. The Phrozen Transform just launched on Kickstarter, but has already reached about seven times its funding goal. That’s because it provides the quality of an SLA 3D printer with the build volume and affordability of an FFF 3D printer. It has a 40 cm (15.75 inch) Z axis, and you can switch between a 13.3" panel or dual 5.5" panels. With the former, you get a total build volume of 29.2 x 16.5 x 40 cm (about 11.5 x 6.5 x 15.75 inches). Compare that to the Formlabs Form 2, one of the leading prosumer SLA 3D printers, which has a build volume of 5.7 x 5.7 x 6.9 inches. That’s more than five times the volume! Even with that massive volume, the Phrozen Transform has a 76µm XY resolution. It uses an interesting ParaLED™ Optical Engine for the LCD, which is advertised as guaranteeing a uniform exposure over 95% of the printing surface area, while also decreasing exposure times. Phrozen Transform can be used with proprietary resins, or with resin from 3rd parties. The Phrozen Transform Kickstarter campaign will be running until January 25th, 2019. With the “Brunch Bird” special, a standard setup costs just $1,299. Rewards are expected to ship in June of 2019.